Orvieto is referenced as Urbiventus - Οὐρβιβεντὸς - an apparent corruption of Urbs Vetus (Vetus from Volsinii) by Procopius, whose description is so much at variance with the appearance of Orvieto that it seems likely that he was describing a different place. In 539, Belisarius, the Byzantine general, starved Witiges, King of the Ostrogoths in Italy from 536 to 540, into surrender and added Orvieto to his holdings. Witiges was taken to Byzantium and died there - so much for him. In 606, Orvieto fell to the Lombards and then to Charlemagne. Orvieto formed part of the donation of the Countess Matilda to the papacy. Municipal independence had probably been acquired as early as the end of the 10 C, but the first of the popes to reside in Orvieto and to recognise its municipal administration was Hadrian IV in 1157. Orvieto was governed by consuls during that period, but various changes of constitution resulted in a larger governing body. The sympathies of Orvieto were always towards the Guelphs, and Orvieto was closely allied with Florence, with which it was in the battle of Montaperti (1260), and its constitution was strongly influenced by the Florentine model. In 1199, the first podestà was elected, and in 1251 the first capitano del popolo. There were considerable Guelph and Ghibelline struggles even at Orvieto, the latter party being finally destroyed in 1313, and the representatives of the former, the Monaldeschi, attaining supreme power. The territory of Orvieto extended from Chiusi to the coast at Orbetello, and to the Lake of Bolsena and the Tiber. The various branches of the Monaldeschi continually fought among themselves, however, and the quarrels of two of them divided the city into two factions under the names of Muffati and Mercorini, whose struggles lasted until 1460, when peace was finally made between them. 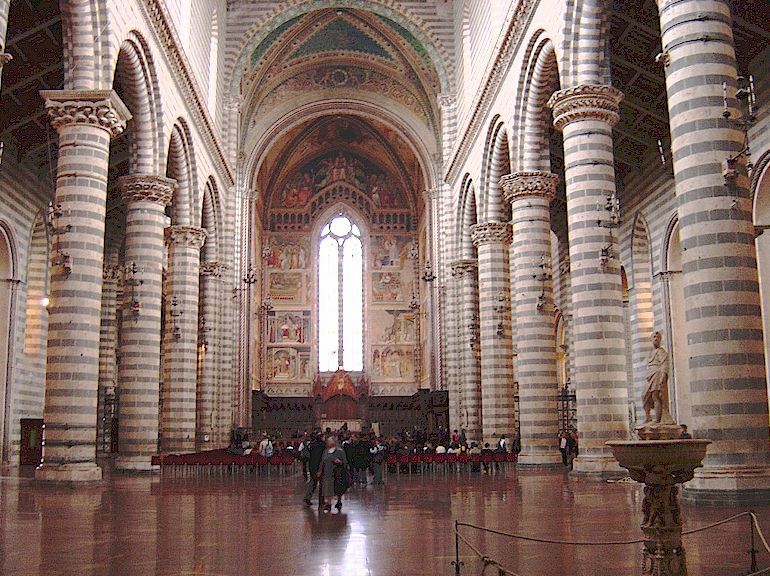 After this period, Orvieto was ruled peaceably by papal governors. Owing to the strong Guelph sympathies of the inhabitants, and the inaccessible nature of the site, Orvieto was constantly used as a place of refuge by the popes. In 1814 it became the principal town of a district, in 1831 of a province, and in 1860 with Umbria became part of the kingdom of Italy, and Orvieto became a subprefecture. Click here for Orvieto hotels, vacation rentals and holiday homes. Orvieto Italy © 2010 - 2018 ammonet InfoTech website design and promotion. All rights reserved.